The epicenter of ranch life in this part of South Texas was Victoria, one of the larger towns in the 1800s. Marketing was done in the shops in downtown Victoria. Brands were registered and marriage licenses obtained at the Courthouse here. Holy days were celebrated in St Mary’s Catholic Church here. The first Lucy had a wagon and a matched pair of grays that took her back and forth along the Old River Road from the ranch to Victoria. 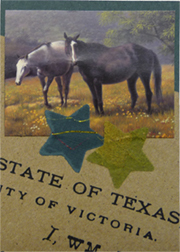 Snip from a painting by Dalhart Windberg, famous Texas artist who resided in Victoria County for a time. Snip from the printed registration of the flower-loose 4 brand.